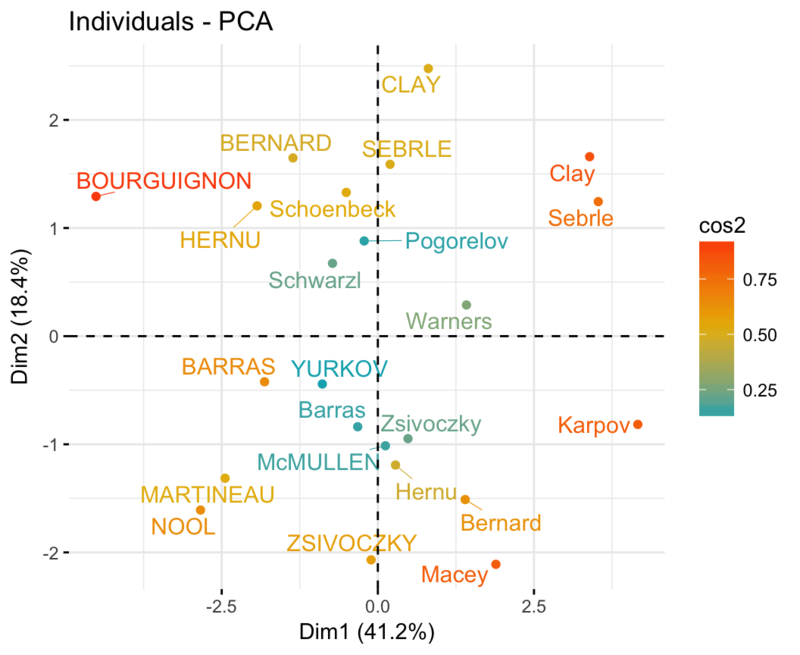 Principal component analysis (PCA) allows us to summarize and to visualize the information in a data set containing individuals/observations described by multiple inter-correlated quantitative variables. Each variable could be considered as a different dimension. If you have more than 3 variables in your data sets, it could be very difficult to visualize a multi-dimensional hyperspace. Principal component analysis is used to extract the important information from a multivariate data table and to express this information as a set of few new variables called principal components. These new variables correspond to a linear combination of the originals. The number of principal components is less than or equal to the number of original variables. The information in a given data set corresponds to the total variation it contains. 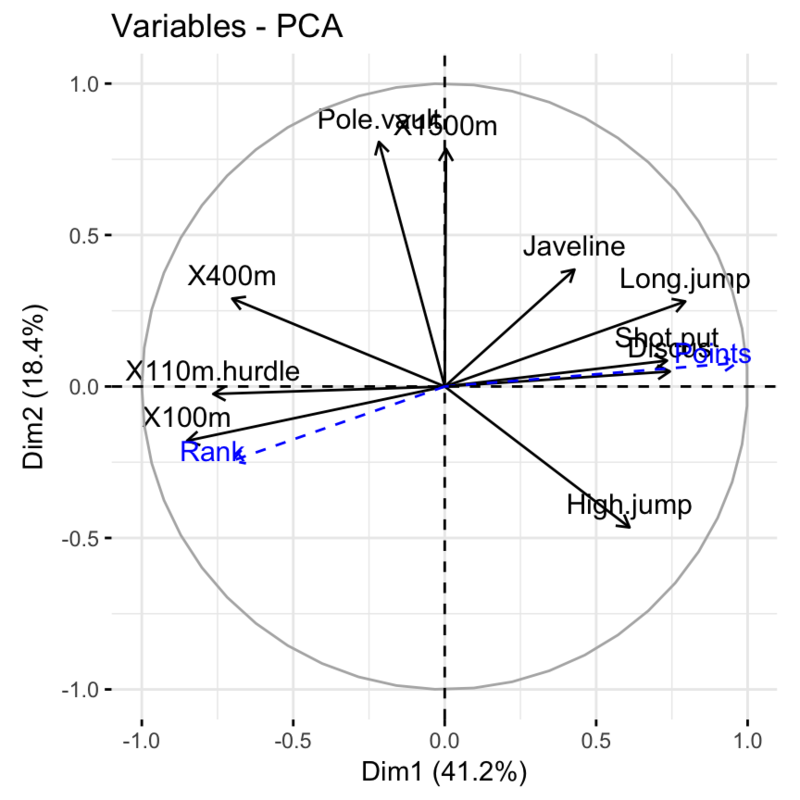 The goal of PCA is to identify directions (or principal components) along which the variation in the data is maximal. In other words, PCA reduces the dimensionality of a multivariate data to two or three principal components, that can be visualized graphically, with minimal loss of information. In this chapter, we describe the basic idea of PCA and, demonstrate how to compute and visualize PCA using R software. Additionally, we’ll show how to reveal the most important variables that explain the variations in a data set. Understanding the details of PCA requires knowledge of linear algebra. Here, we’ll explain only the basics with simple graphical representation of the data. In the Plot 1A below, the data are represented in the X-Y coordinate system. The dimension reduction is achieved by identifying the principal directions, called principal components, in which the data varies. PCA assumes that the directions with the largest variances are the most “important” (i.e, the most principal). In the figure below, the PC1 axis is the first principal direction along which the samples show the largest variation. The PC2 axis is the second most important direction and it is orthogonal to the PC1 axis. Technically speaking, the amount of variance retained by each principal component is measured by the so-called eigenvalue. Note that, the PCA method is particularly useful when the variables within the data set are highly correlated. 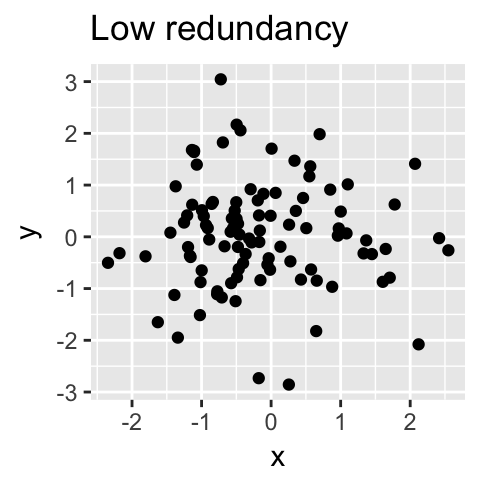 Correlation indicates that there is redundancy in the data. Due to this redundancy, PCA can be used to reduce the original variables into a smaller number of new variables ( = principal components) explaining most of the variance in the original variables. 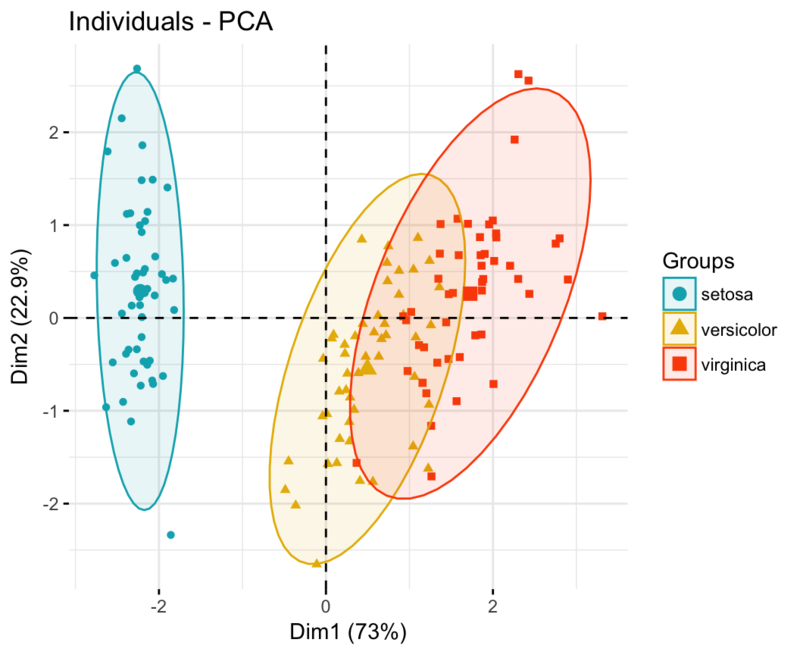 No matter what function you decide to use, you can easily extract and visualize the results of PCA using R functions provided in the factoextra R package. 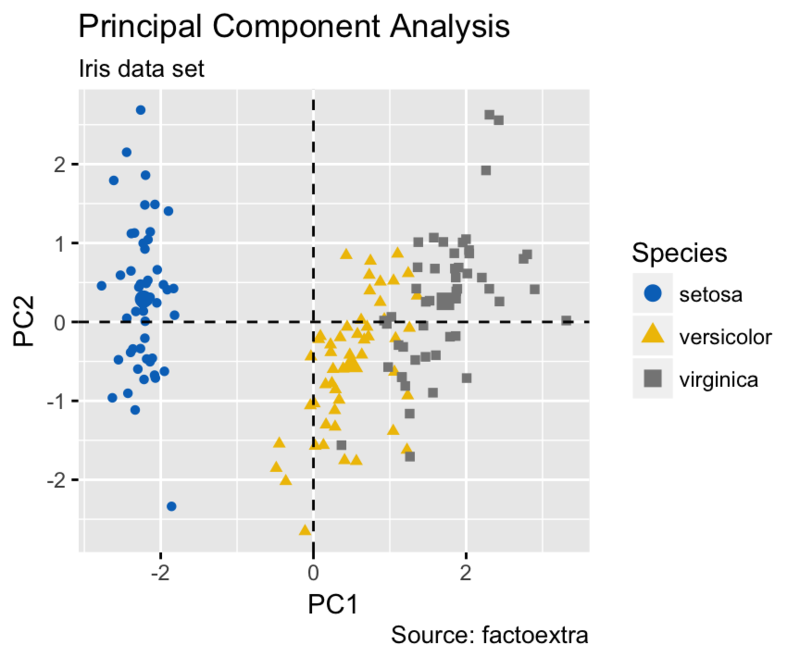 Here, we’ll use the two packages FactoMineR (for the analysis) and factoextra (for ggplot2-based visualization). 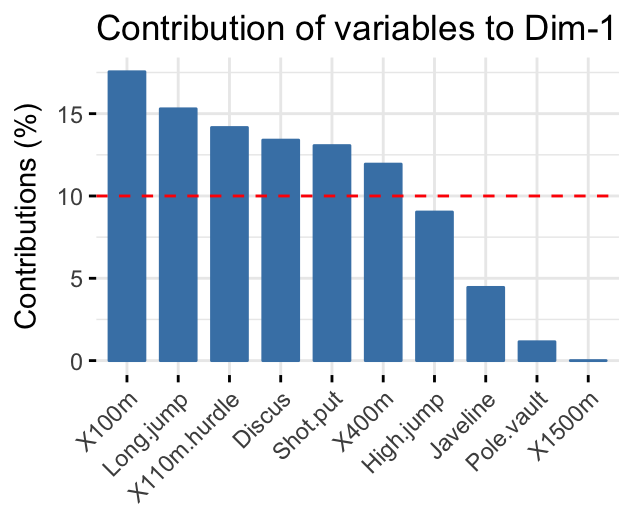 As illustrated in Figure 3.1, the data used here describes athletes’ performance during two sporting events (Desctar and OlympicG). 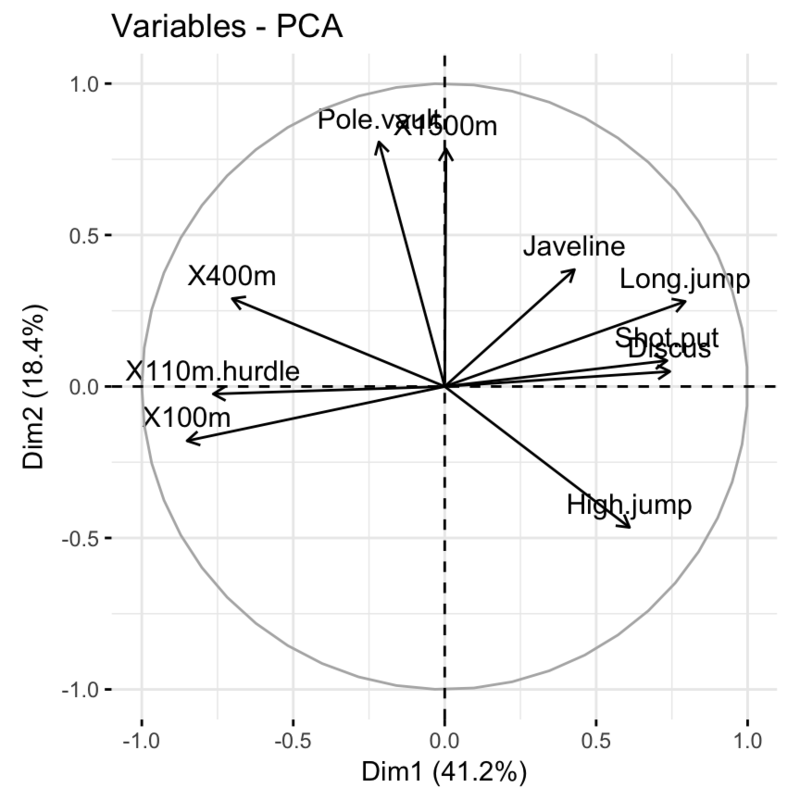 It contains 27 individuals (athletes) described by 13 variables. Note that, only some of these individuals and variables will be used to perform the principal component analysis. The coordinates of the remaining individuals and variables on the factor map will be predicted after the PCA. 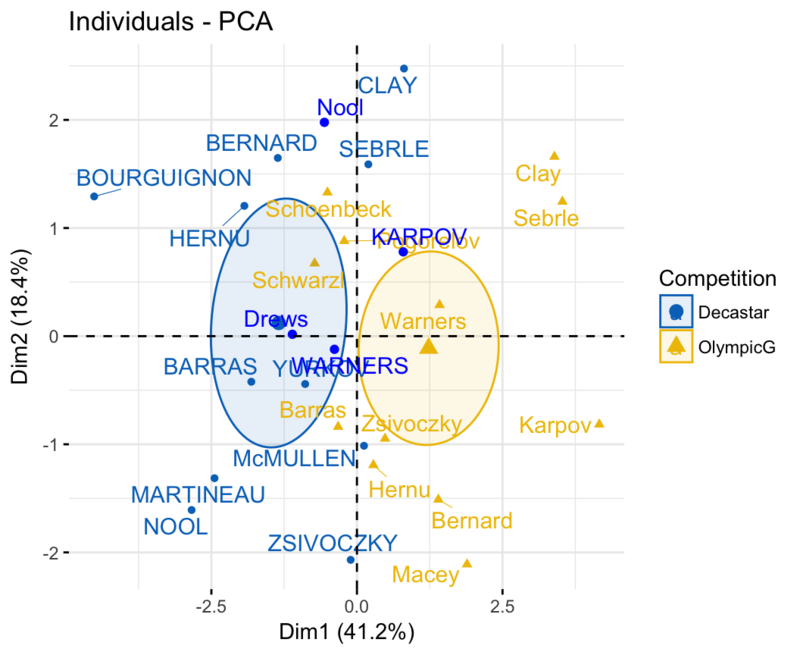 Active individuals (in light blue, rows 1:23) : Individuals that are used during the principal component analysis. Active variables (in pink, columns 1:10) : Variables that are used for the principal component analysis. 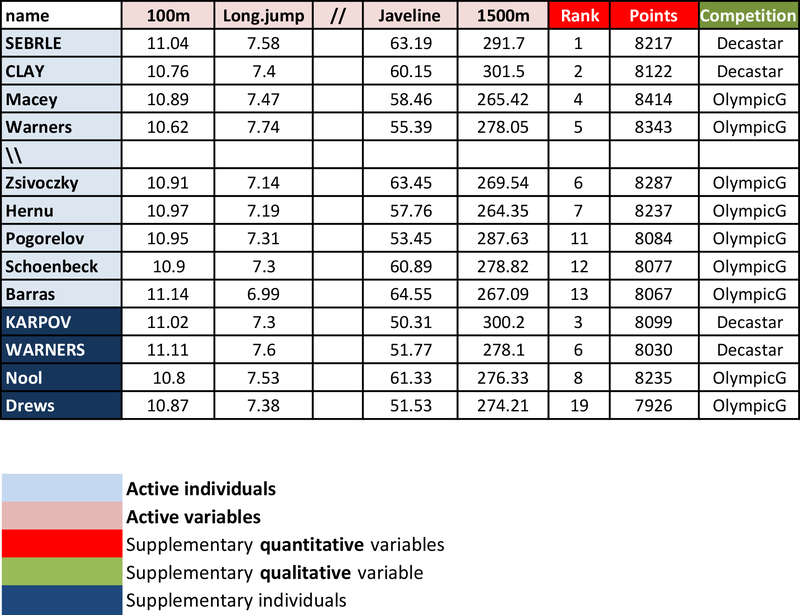 Supplementary continuous variables (red): Columns 11 and 12 corresponding respectively to the rank and the points of athletes. 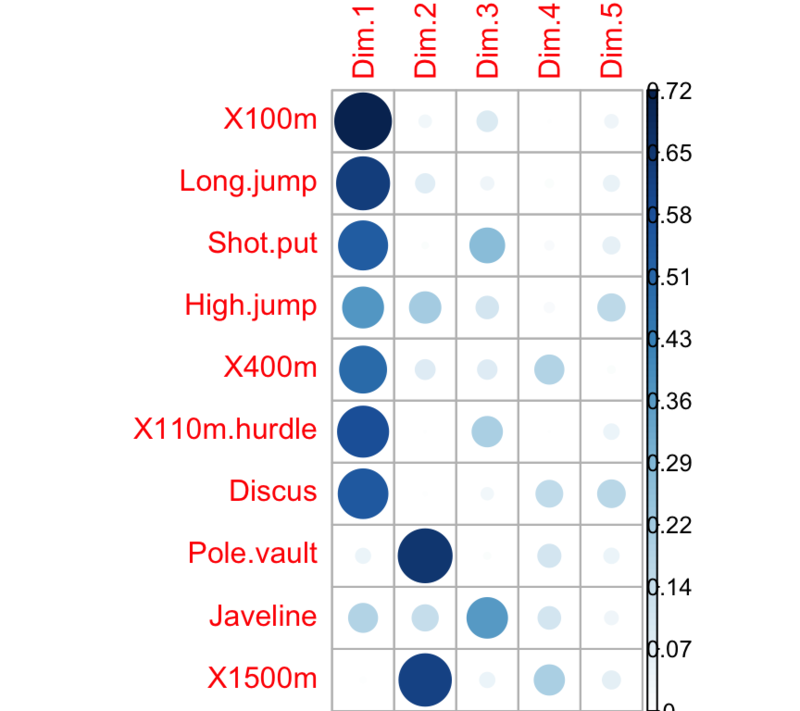 Supplementary qualitative variables (green): Column 13 corresponding to the two athlete-tic meetings (2004 Olympic Game or 2004 Decastar). This is a categorical (or factor) variable factor. It can be used to color individuals by groups. In principal component analysis, variables are often scaled (i.e. standardized). This is particularly recommended when variables are measured in different scales (e.g: kilograms, kilometers, centimeters, …); otherwise, the PCA outputs obtained will be severely affected. The goal is to make the variables comparable. Generally variables are scaled to have i) standard deviation one and ii) mean zero. The standardization of data is an approach widely used in the context of gene expression data analysis before PCA and clustering analysis. We might also want to scale the data when the mean and/or the standard deviation of variables are largely different. Where \(mean(x)\) is the mean of x values, and \(sd(x)\) is the standard deviation (SD). The R base function `scale() can be used to standardize the data. It takes a numeric matrix as an input and performs the scaling on the columns. Note that, by default, the function PCA() [in FactoMineR], standardizes the data automatically during the PCA; so you don’t need do this transformation before the PCA. scale.unit: a logical value. If TRUE, the data are scaled to unit variance before the analysis. This standardization to the same scale avoids some variables to become dominant just because of their large measurement units. It makes variable comparable. The object that is created using the function PCA() contains many information found in many different lists and matrices. These values are described in the next section. We’ll use the factoextra R package to help in the interpretation of PCA. No matter what function you decide to use [stats::prcomp(), FactoMiner::PCA(), ade4::dudi.pca(), ExPosition::epPCA()], you can easily extract and visualize the results of PCA using R functions provided in the factoextra R package. get_pca_ind(res.pca), get_pca_var(res.pca): Extract the results for individuals and variables, respectively. 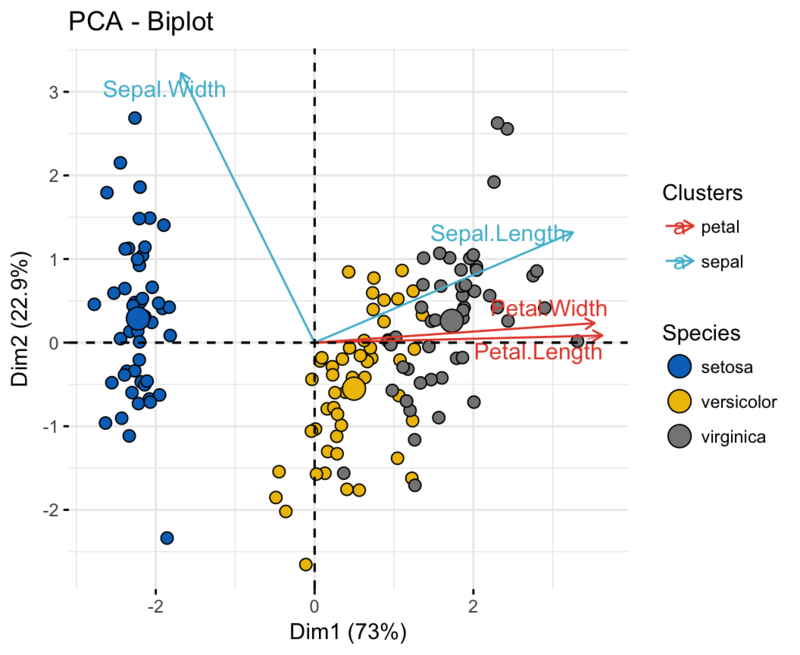 fviz_pca_ind(res.pca), fviz_pca_var(res.pca): Visualize the results individuals and variables, respectively. 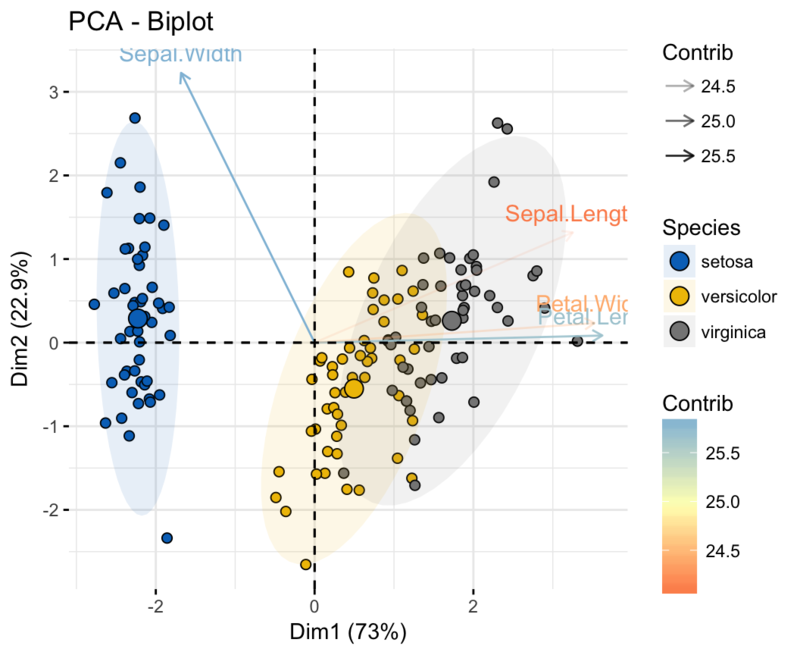 fviz_pca_biplot(res.pca): Make a biplot of individuals and variables. As described in previous sections, the eigenvalues measure the amount of variation retained by each principal component. Eigenvalues are large for the first PCs and small for the subsequent PCs. That is, the first PCs corresponds to the directions with the maximum amount of variation in the data set. We examine the eigenvalues to determine the number of principal components to be considered. The eigenvalues and the proportion of variances (i.e., information) retained by the principal components (PCs) can be extracted using the function get_eigenvalue() [factoextra package]. The sum of all the eigenvalues give a total variance of 10. The proportion of variation explained by each eigenvalue is given in the second column. For example, 4.124 divided by 10 equals 0.4124, or, about 41.24% of the variation is explained by this first eigenvalue. The cumulative percentage explained is obtained by adding the successive proportions of variation explained to obtain the running total. For instance, 41.242% plus 18.385% equals 59.627%, and so forth. Therefore, about 59.627% of the variation is explained by the first two eigenvalues together. An eigenvalue > 1 indicates that PCs account for more variance than accounted by one of the original variables in standardized data. This is commonly used as a cutoff point for which PCs are retained. This holds true only when the data are standardized. You can also limit the number of component to that number that accounts for a certain fraction of the total variance. For example, if you are satisfied with 70% of the total variance explained then use the number of components to achieve that. Unfortunately, there is no well-accepted objective way to decide how many principal components are enough. This will depend on the specific field of application and the specific data set. In practice, we tend to look at the first few principal components in order to find interesting patterns in the data. In our analysis, the first three principal components explain 72% of the variation. This is an acceptably large percentage. An alternative method to determine the number of principal components is to look at a Scree Plot, which is the plot of eigenvalues ordered from largest to the smallest. The number of component is determined at the point, beyond which the remaining eigenvalues are all relatively small and of comparable size (Jollife 2002, Peres-Neto, Jackson, and Somers (2005)). From the plot above, we might want to stop at the fifth principal component. 87% of the information (variances) contained in the data are retained by the first five principal components. var$cos2: represents the quality of representation for variables on the factor map. It’s calculated as the squared coordinates: var.cos2 = var.coord * var.coord. var$contrib: contains the contributions (in percentage) of the variables to the principal components. The contribution of a variable (var) to a given principal component is (in percentage) : (var.cos2 * 100) / (total cos2 of the component). Note that, it’s possible to plot variables and to color them according to either i) their quality on the factor map (cos2) or ii) their contribution values to the principal components (contrib). In this section, we describe how to visualize variables and draw conclusions about their correlations. Next, we highlight variables according to either i) their quality of representation on the factor map or ii) their contributions to the principal components. The correlation between a variable and a principal component (PC) is used as the coordinates of the variable on the PC. The representation of variables differs from the plot of the observations: The observations are represented by their projections, but the variables are represented by their correlations (Abdi and Williams 2010). The distance between variables and the origin measures the quality of the variables on the factor map. Variables that are away from the origin are well represented on the factor map. A high cos2 indicates a good representation of the variable on the principal component. In this case the variable is positioned close to the circumference of the correlation circle. A low cos2 indicates that the variable is not perfectly represented by the PCs. In this case the variable is close to the center of the circle. For a given variable, the sum of the cos2 on all the principal components is equal to one. If a variable is perfectly represented by only two principal components (Dim.1 & Dim.2), the sum of the cos2 on these two PCs is equal to one. In this case the variables will be positioned on the circle of correlations. For some of the variables, more than 2 components might be required to perfectly represent the data. In this case the variables are positioned inside the circle of correlations. The contributions of variables in accounting for the variability in a given principal component are expressed in percentage. 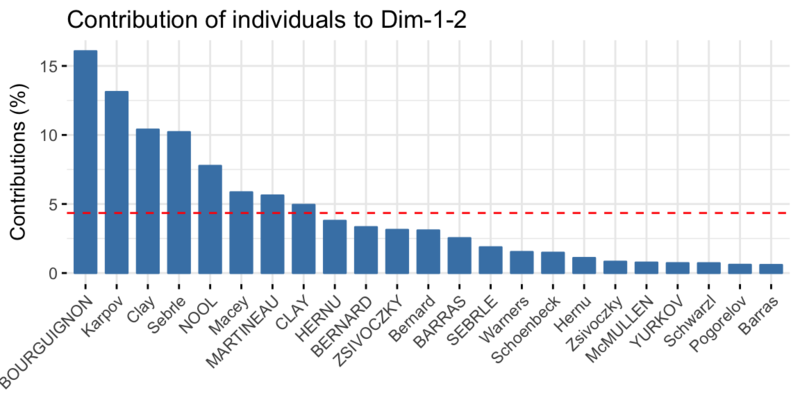 Variables that are correlated with PC1 (i.e., Dim.1) and PC2 (i.e., Dim.2) are the most important in explaining the variability in the data set. Variables that do not correlated with any PC or correlated with the last dimensions are variables with low contribution and might be removed to simplify the overall analysis. The larger the value of the contribution, the more the variable contributes to the component. The red dashed line on the graph above indicates the expected average contribution. If the contribution of the variables were uniform, the expected value would be 1/length(variables) = 1/10 = 10%. For a given component, a variable with a contribution larger than this cutoff could be considered as important in contributing to the component. Eig1 and Eig2 are the eigenvalues of PC1 and PC2, respectively. 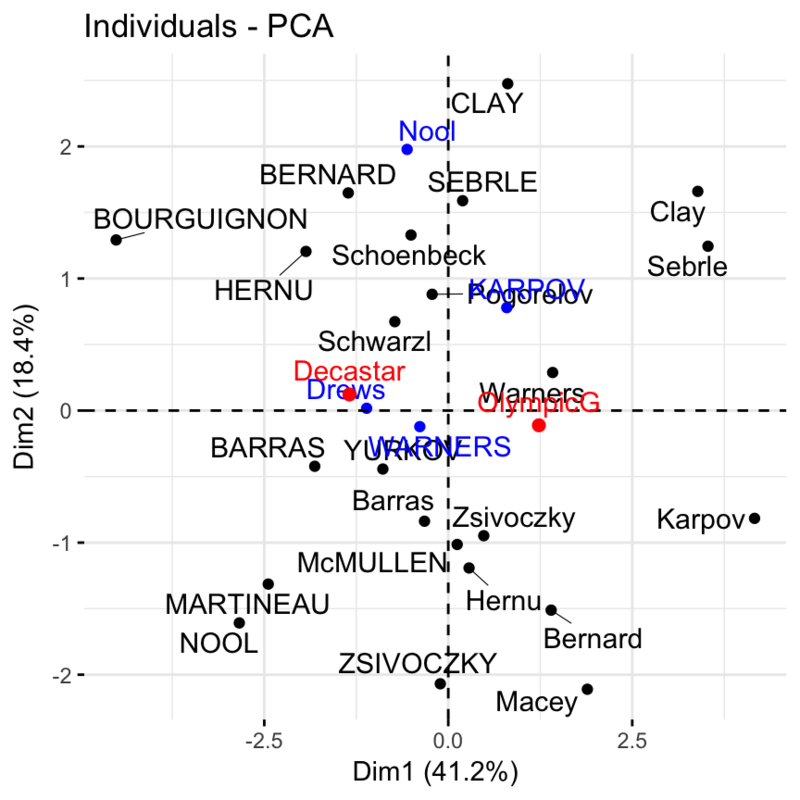 Recall that eigenvalues measure the amount of variation retained by each PC. 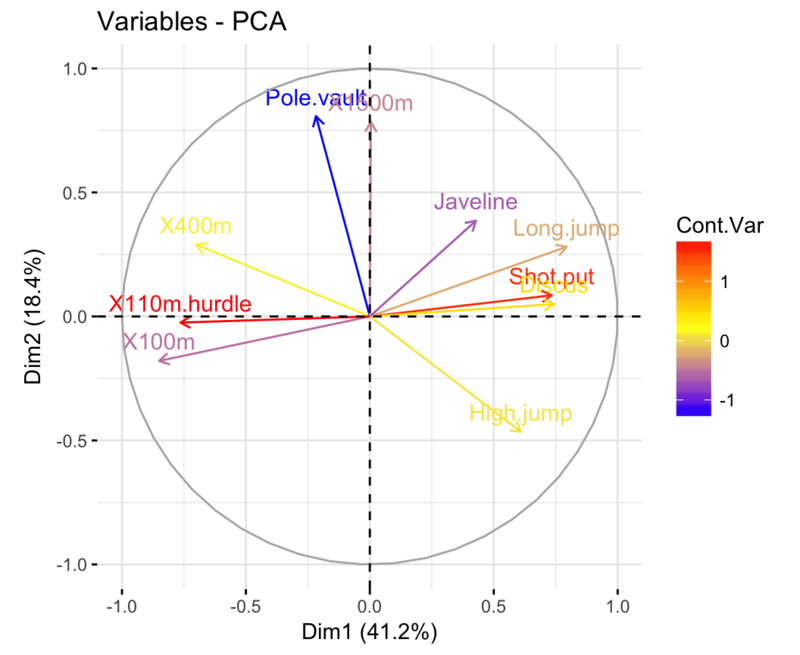 It can be seen that the variables - X100m, Long.jump and Pole.vault - contribute the most to the dimensions 1 and 2. In the previous sections, we showed how to color variables by their contributions and their cos2. Note that, it’s possible to color variables by any custom continuous variable. The coloring variable should have the same length as the number of active variables in the PCA (here n = 10). It’s also possible to change the color of variables by groups defined by a qualitative/categorical variable, also called factor in R terminology. As we don’t have any grouping variable in our data sets for classifying variables, we’ll create it. In the following demo example, we start by classifying the variables into 3 groups using the kmeans clustering algorithm. Next, we use the clusters returned by the kmeans algorithm to color variables. Note that, if you are interested in learning clustering, we previously published a book named “Practical Guide To Cluster Analysis in R” (https://goo.gl/DmJ5y5). Note that, to change the color of groups the argument palette should be used. To change gradient colors, the argument gradient.cols should be used. In the section @ref(pca-variable-contributions), we described how to highlight variables according to their contributions to the principal components. In the output above, $quanti means results for quantitative variables. Note that, variables are sorted by the p-value of the correlation. Note that, individuals that are similar are grouped together on the plot. As for variables, individuals can be colored by any custom continuous variable by specifying the argument col.ind. Here, we describe how to color individuals by group. Additionally, we show how to add concentration ellipses and confidence ellipses by groups. For this, we’ll use the iris data as demo data sets. In the R code below: the argument habillage or col.ind can be used to specify the factor variable for coloring the individuals by groups. To add a concentration ellipse around each group, specify the argument addEllipses = TRUE. The argument palette can be used to change group colors. To remove the group mean point, specify the argument mean.point = FALSE. If you want confidence ellipses instead of concentration ellipses, use ellipse.type = “confidence”. brewer palettes e.g. “RdBu”, “Blues”, …; To view all, type this in R: RColorBrewer::display.brewer.all(). and scientific journal palettes from ggsci R package, e.g. : “npg”, “aaas”, “lancet”, “jco”, “ucscgb”, “uchicago”, “simpsons” and “rickandmorty”. Note that, fviz_pca_ind() and fviz_pca_var() and related functions are wrapper around the core function fviz() [in factoextra]. fviz() is a wrapper around the function ggscatter() [in ggpubr]. Therefore, further arguments, to be passed to the function fviz() and ggscatter(), can be specified in fviz_pca_ind() and fviz_pca_var(). Here, we present some of these additional arguments to customize the PCA graph of variables and individuals. 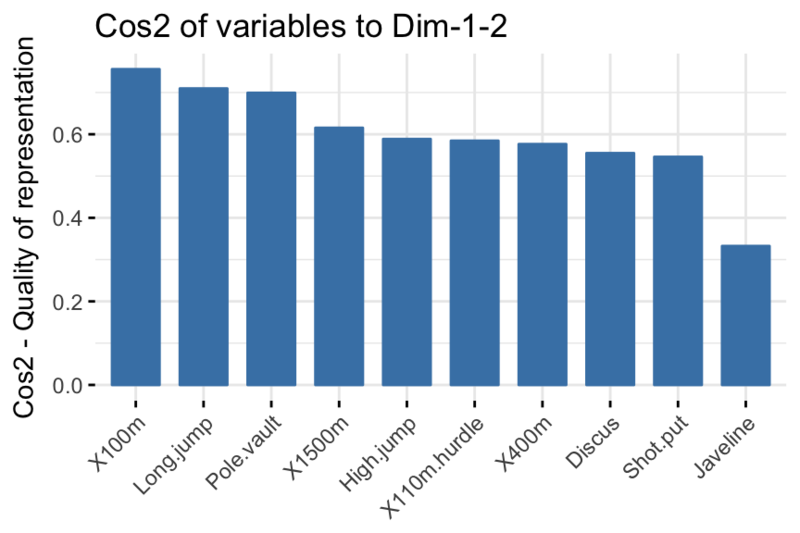 By default, variables/individuals are represented on dimensions 1 and 2. 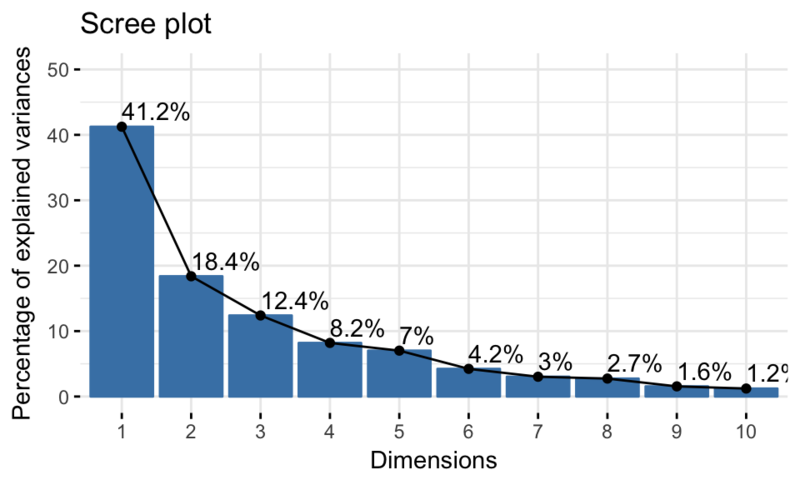 If you want to visualize them on dimensions 2 and 3, for example, you should specify the argument axes = c(2, 3). The argument geom (for geometry) and derivatives are used to specify the geometry elements or graphical elements to be used for plotting. geom.var: a text specifying the geometry to be used for plotting variables. Allowed values are the combination of c(“point”, “arrow”, “text”). Use geom.var = c("arrow", "text") to show arrows and labels (default). geom.ind: a text specifying the geometry to be used for plotting individuals. Allowed values are the combination of c(“point”, “text”). labelsize: font size for the text labels, e.g. : labelsize = 4.
pointsize: the size of points, e.g. : pointsize = 1.5.
arrowsize: the size of arrows. Controls the thickness of arrows, e.g. : arrowsize = 0.5.
pointshape: the shape of points, pointshape = 21. Type ggpubr::show_point_shapes() to see available point shapes. As we described in the previous section @ref(color-ind-by-groups), when coloring individuals by groups, you can add point concentration ellipses using the argument addEllipses = TRUE. "convex": plot convex hull of a set o points. "confidence": plot confidence ellipses around group mean points as the function coord.ellipse() [in FactoMineR]. "t": assumes a multivariate t-distribution. "norm": assumes a multivariate normal distribution. "euclid": draws a circle with the radius equal to level, representing the euclidean distance from the center. This ellipse probably won’t appear circular unless coord_fixed() is applied. The argument ellipse.level is also available to change the size of the concentration ellipse in normal probability. For example, specify ellipse.level = 0.95 or ellipse.level = 0.66. When coloring individuals by groups (section @ref(color-ind-by-groups)), the mean points of groups (barycenters) are also displayed by default. To remove the mean points, use the argument mean.point = FALSE. The argument axes.linetype can be used to specify the line type of axes. Default is “dashed”. Allowed values include “blank”, “solid”, “dotted”, etc. To see all possible values type ggpubr::show_line_types() in R.
Legend position. Possible values: “top”, “bottom”, “left”, “right”, “none”. Themes. Allowed values include: theme_gray(), theme_bw(), theme_minimal(), theme_classic(), theme_void(). 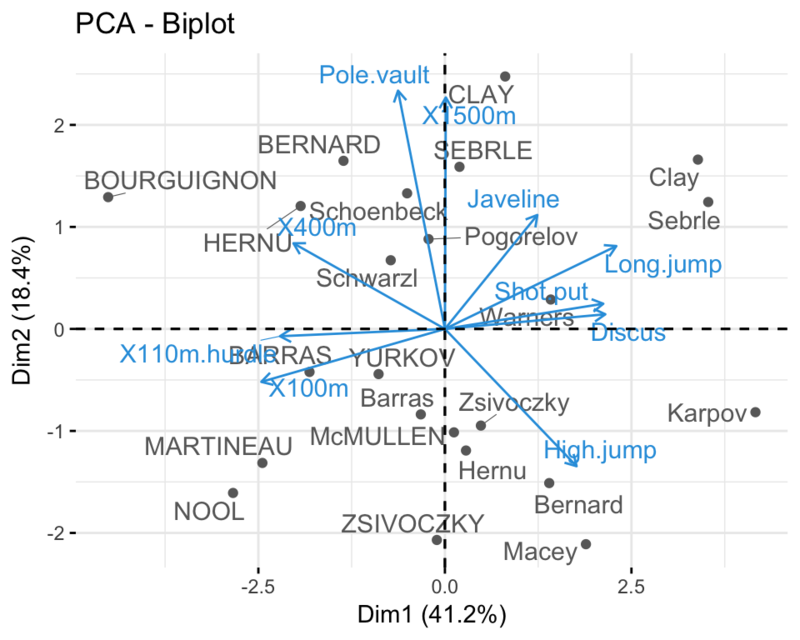 Note that, the biplot might be only useful when there is a low number of variables and individuals in the data set; otherwise the final plot would be unreadable. Note also that, the coordinate of individuals and variables are not constructed on the same space. Therefore, in the biplot, you should mainly focus on the direction of variables but not on their absolute positions on the plot. an individual that is on the opposite side of a given variable has a low value for this variable. show only the labels for variables: label = "var" or use geom.ind = "point"
In the following example, we want to color both individuals and variables by groups. The trick is to use pointshape = 21 for individual points. This particular point shape can be filled by a color using the argument fill.ind. The border line color of individual points is set to “black” using col.ind. To color variable by groups, the argument col.var will be used. To customize individuals and variable colors, we use the helper functions fill_palette() and color_palette() [in ggpubr package]. Another complex example is to color individuals by groups (discrete color) and variables by their contributions to the principal components (gradient colors). Additionally, we’ll change the transparency of variables by their contributions using the argument alpha.var. 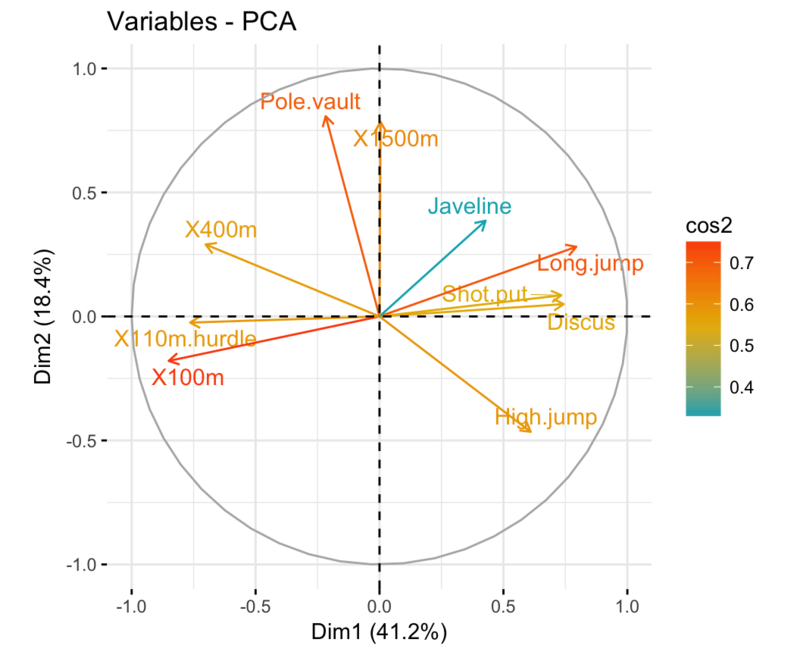 As described above (section @ref(pca-data-format)), the decathlon2 data sets contain supplementary continuous variables (quanti.sup, columns 11:12), supplementary qualitative variables (quali.sup, column 13) and supplementary individuals (ind.sup, rows 24:27). Supplementary variables and individuals are not used for the determination of the principal components. Their coordinates are predicted using only the information provided by the performed principal component analysis on active variables/individuals. X : a data frame. Rows are individuals and columns are numeric variables. Note that, by default, supplementary quantitative variables are shown in blue color and dashed lines. 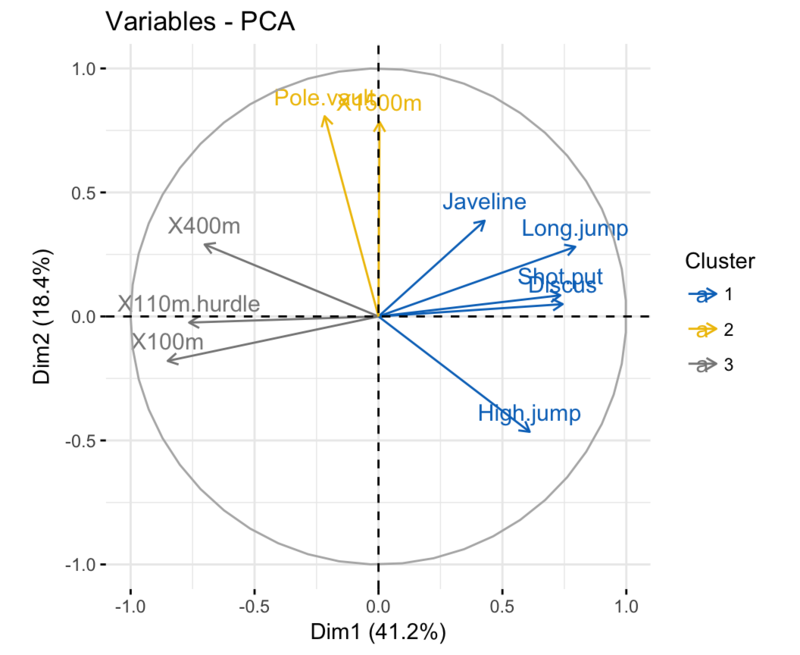 Using the fviz_pca_var(), the quantitative supplementary variables are displayed automatically on the correlation circle plot. Note that, you can add the quanti.sup variables manually, using the fviz_add() function, for further customization. An example is shown below. Visualize all individuals (active and supplementary ones). On the graph, you can add also the supplementary qualitative variables (quali.sup), which coordinates is accessible using res.pca$quali.supp$coord. Supplementary individuals are shown in blue. The levels of the supplementary qualitative variable are shown in red color. 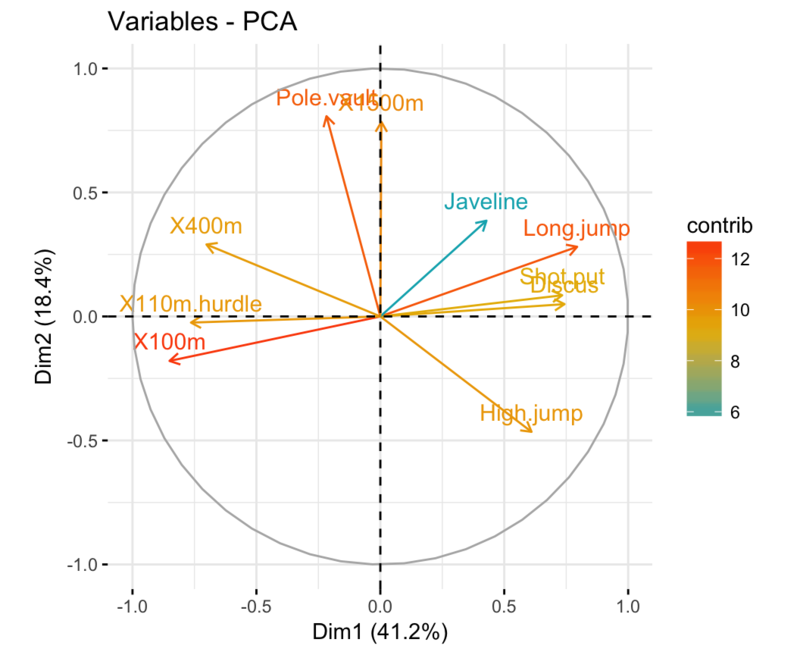 In the previous section, we showed that you can add the supplementary qualitative variables on individuals plot using fviz_add(). Note that, the supplementary qualitative variables can be also used for coloring individuals by groups. This can help to interpret the data. 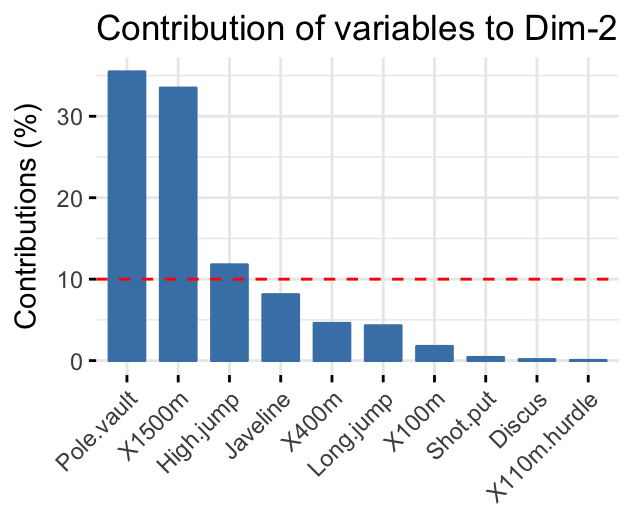 The data sets decathlon2 contain a supplementary qualitative variable at columns 13 corresponding to the type of competitions. Recall that, to remove the mean points of groups, specify the argument mean.point = FALSE. If you have many individuals/variable, it’s possible to visualize only some of them using the arguments select.ind and select.var. When the selection is done according to the contribution values, supplementary individuals/variables are not shown because they don’t contribute to the construction of the axes. In the following examples, we’ll show you how to save the different graphs into pdf or png files. Note that, using the above R code will create the PDF file into your current working directory. To see the path of your current working directory, type getwd() in the R console. 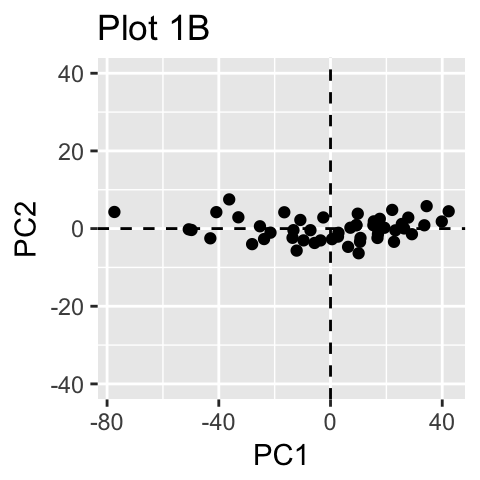 Another alternative, to export ggplots, is to use the function ggexport() [in ggpubr package]. We like ggexport(), because it’s very simple. With one line R code, it allows us to export individual plots to a file (pdf, eps or png) (one plot per page). It can also arrange the plots (2 plot per page, for example) before exporting them. 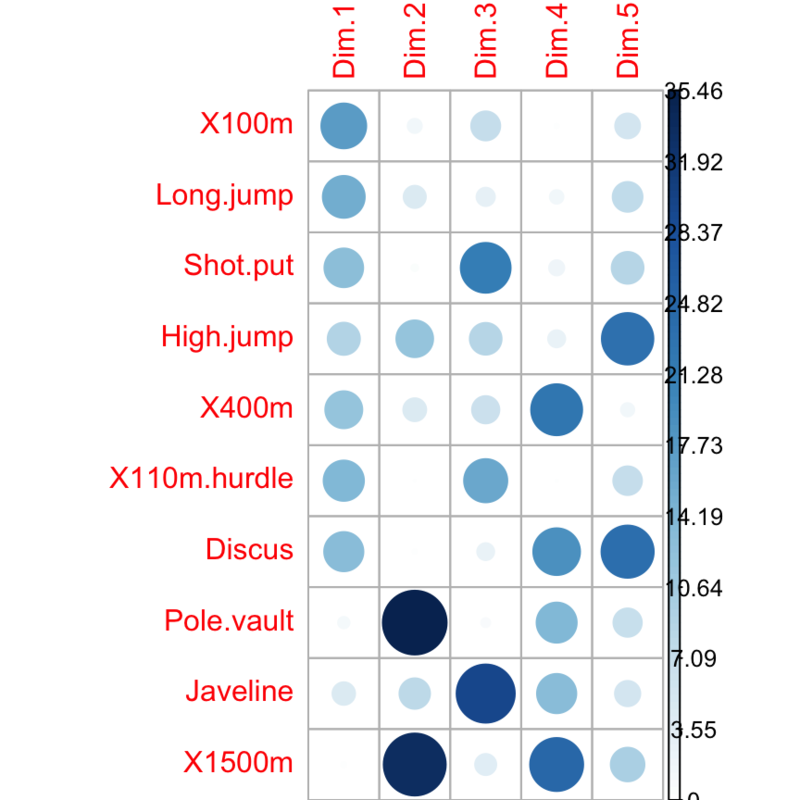 The examples below demonstrates how to export ggplots using ggexport(). Export plots to png files. If you specify a list of plots, then multiple png files will be automatically created to hold each plot. In conclusion, we described how to perform and interpret principal component analysis (PCA). We computed PCA using the PCA() function [FactoMineR]. 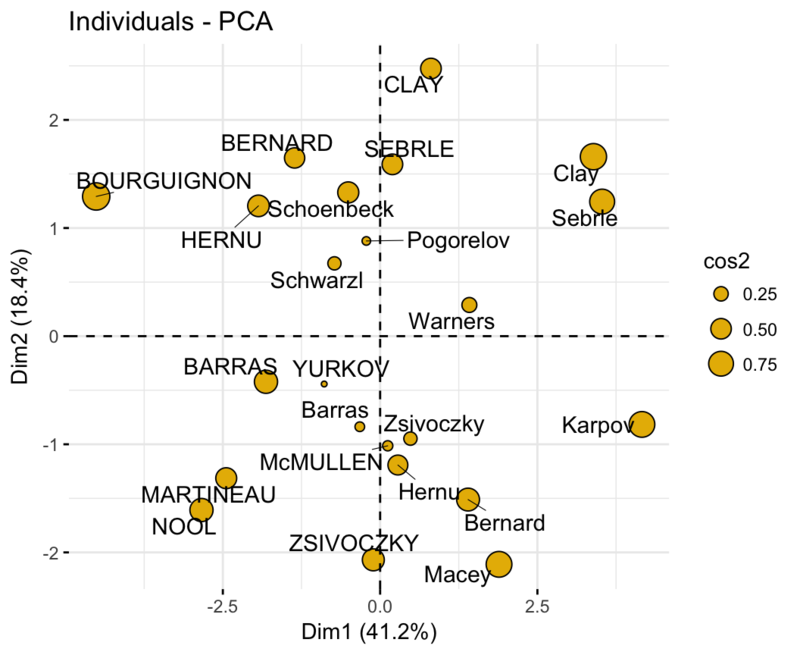 Next, we used the factoextra R package to produce ggplot2-based visualization of the PCA results. Great article, very helpful. I have a question, I would like to extract PCs to use them as new variables that can represent the variables I used in the PCA. Is there a way to do this using FactomineR or factoextra ? 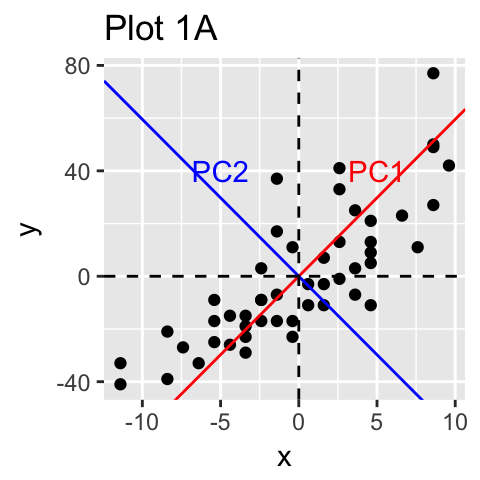 Also, you showed how to use a qualitative variable for grouping on the individual plot, is there a way to do it on the correlation circle ? Hey, Awesome article. I have a very basic questions - suppose when you have a dataset with more than 200 features and before performing PCA as we need to check for the correlation (Redundancy) within the dataset. 1.How do you determine that limit (correlation coefficient) that your variables have this redundancy which is good enough to have accurate results with PCA ? and Do we have a way other than corplot to know the correlations for all those 200 variables ? 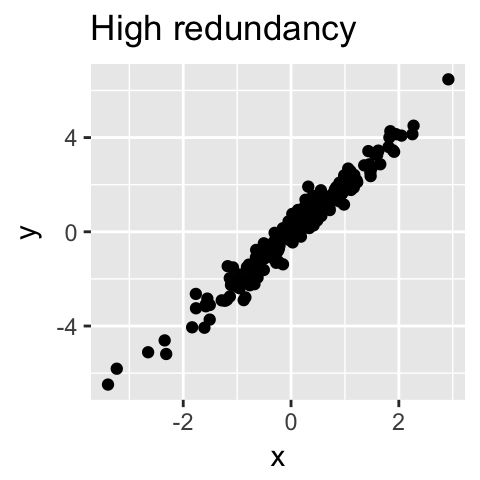 2.If Suppose some of the variables have low redundancy , then what are we supposed to do with those variables? Never mind. I believe I figured this out. I simply misunderstood what the function was doing. The length of color variableshould be the same as the number of rows in the data. Wow! This is the PCA tutorial I have always been looking for but could never find. I was beginning to think it didn't exist! Thanks for giving me the info I need to step up my PCA game! Hi. Thanks for this tutorial. I have a question. 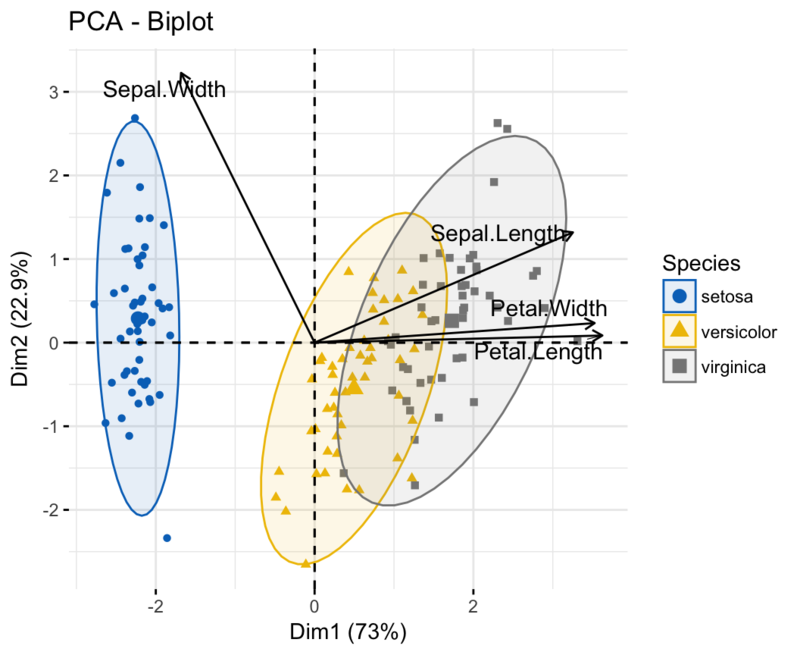 How can I change the type of font and put bold in fviz_pca_biplot to the labels of the individuals and the variables? Hi I do not understand how you removed the shading of the ellipse in one of the biplot examples? I want my individual plot to have ellipses but without the shading in the ellipse. Also could you explain what concentration ellipses represent versus confidence ellipses? Another question: Is there any way I can put redundant labels on the individuals? I need this since at times the data in the unique label is also present in the legend, and the long labels are unnecessary. Thank you for the very clear and extensive information, it works perfectly! Great help! can I make repel for certain points only but not all? and to be able to choose where the repelled labels appear.